Read the amazing reviews for the webinar. I presented on the importance of earning advanced certification tonight. Here is the feedback comments from the 61 people (who submitted an evaluation) out of the 101 people who attended and participated (which is the max for my webinar subscription). Sixty-one people submitted an evaluation. I asked people to rate the training on a scale of 0 poor to 10 excellent. Is that possible? It turns out that I was looking at the wrong place. laugh aloud. I didn’t get a perfect ten. I did get about a 9.15. Scores ranged from 7 to 10. Outlier was omitted from the results. It was 1Million!!!! (and I appreciate that). Two people didn’t give a response on the 0 to 10 question. I enjoyed the way the presenter kept the webinar humorous, and learning about the different types of specialties offered by the NCTRC, the top reasons why, and the 2 processes to earn the advanced certification. I enjoyed learning in depth information about the 5 specialty certification that are offered to CTRS as additional education. That Danny was able to answer all questions that was asked. The session was informative and my first time joining. It’s nice to learn what new things are out there! The detail in the path to getting a specialty certification. I enjoyed hearing about specializations in Recreational Therapy. I enjoyed the presentation on why one should bother getting the specialty certification. It was motivating. Answered my questions about advanced certifications. I’m excited to learn more about advanced specialty certifications. My bachelor’s is in Special Education and my master’s is in Rec Therapy. I’m going to look into getting certified in developmental disabilities. The importance of getting specialty certifications and the presenter. Danny Pettry was enthused about our profession and it showed through his presentation. It encouraged me to seek specialty certification sooner than later. Really hadn’t heard about these specialization. Very informative! Always great to be informed. Very encouraging to seek more within field. I already hold my specialty certification in Behavioral Health. I appreciate the support, encouragement and informative presentation. Yes, Danny Pettry did a great job providing solid reasons why a specialization certification is important not only for the professional obtaining it, but for the recreational therapy profession. I learned now that NCTRC offers specialty certifications. So this was very informative. I enjoyed getting clarity on how to earn a specialty certification and what it would involve. I also enjoyed that Danny read the comments of others attending the group. I enjoyed the interactive component. It was very informative and makes me want to strive for the physical rehabilitation specialty! The thoroughness of discussing options to obtain specialty certification. Great information at the end of my recreation career so specialty isn’t for me. Learning about the different specialty certifications, as well as, how to achieve one. I have not considered a specialization certification before but am now will be considering it. Good information from someone who’s already been through the specialty certification. It’s good information for new CTRS’s. It makes more sense to me now how other health professions have specialties and we should as well. I had never considered this aspect before and it makes more sense now. Very informational about specialty certification. The informative ways to get the advanced certification and the different ones out there. I think it was fine the way it was. More dynamic. Increase examples of where/how to use each specialty, how it changes practice, get some people who are currently using their specialty certification to speak about how it has helped them – Danny Pettry comments thank you for that suggestion. I am going to include examples of people using the certification at my rectherapytoday blog. It was great! No complaints! More detail about how each specialty certification can benefit you or make you more marketable. I think it was very helpful. I think it was great. I’m not sure it could have been improved. A little bit more organized, but I’m no public speaker either. Danny Pettry comments: thank you for that. Maybe I can provide a pre-outline for people to view. I like the improvement you made staying within the hour time frame and allowing some to leave if they needed to at the exact hour. Funnier jokes! But besides that, it was great overall. Danny Pettry comments: I’m the worst comedian. Laugh aloud. And easy-going. I’ll try to use more humor. Give more information in regards to the specifics of each specialty certification. Danny Pettry comments: thank you for that. I really enjoyed it as is. Have the interactive portions viewable to all participants. More jokes 🙂 Danny’s comments? More jokes? Are you kidding me? Okay – here is one more fun fact: why don’t sharks eat clown fish? Because they taste funny. Laugh aloud. I’m easy –going. Thanks for that feedback. Maybe a little bit more interactive but it was great DannyPettry comments: Thank for that. I’ll keep that in mind for next session. No improvement. Thought it was wonderful. Hi Danny! 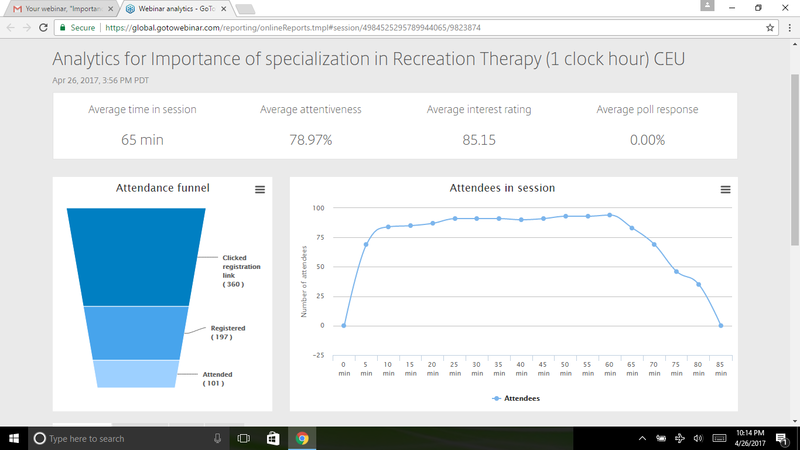 Insights for your webinar, “Importance of specialization in Recreation Therapy (1 clock hour) CEU,” are ready.